So there you are happily managing your AutoCAD files in Vault … doing a rename, changing the lifecycle or some other task that gives you a new version of the file … there’s no image available on the preview tab, so you select the update button, the files is processed … and `hey-presto’ there’s nothing there!?! … it can be pretty frustrating! 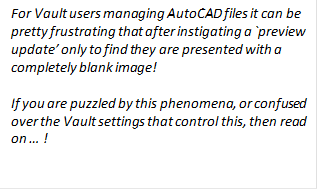 If you are one of many users where your company’s AutoCAD files are created in Model Space, then you need to adjust some of the Vault settings so that new dwf files (used by Vault to preview the image) reflect the updated file version. Before we start it is worth remembering there are two ways that dwfs are created and stored in Vault. The first is by the CAD application (e.g. AutoCAD, Inventor etc.) which can create an image when the data is checked into Vault; note that this function is turned on as a default. The second way is created / managed by Vault using a background application (e.g. 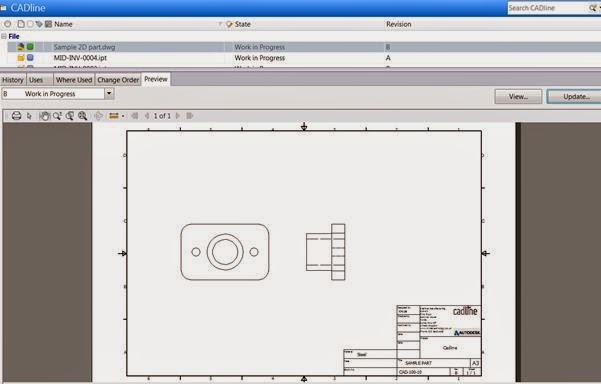 DWGTrueView for AutoCAD files and Inventor for all Inventor related file-types). This article covers only the second method, i.e. dwf data created/managed by Vault. To access the visualization (dwf) settings for Vault, from the menus select Tools > Administration > Vault Settings (remember that you will need Vault Administrator rights to access and change these settings). 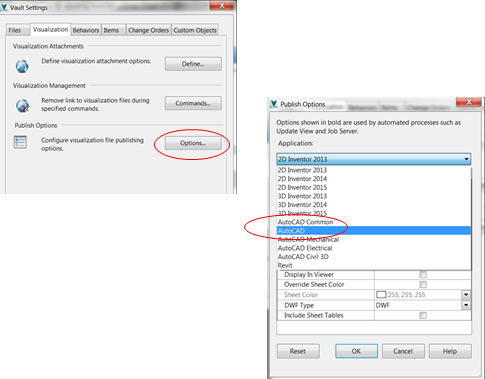 From the Visualizations tab select the Options (Publish Options), then select the particular AutoCAD application to be applied (example shows the selection for AutoCAD `Vanilla’). Note the exercise will have to be repeated if multiple AutoCAD types are being used. 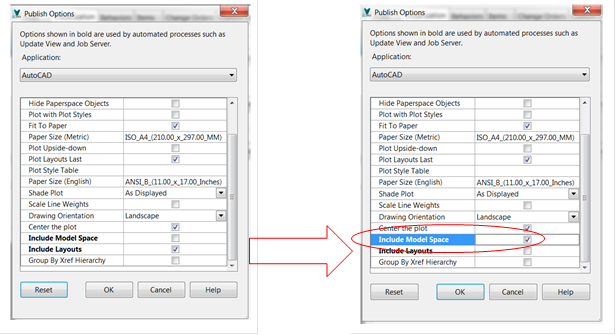 It is worth noting that the default setting for the Model Space / Layout Space creation is set to Layout only (which is a bit strange when you think about it as nearly all AutoCAD drawings start of in Model Space, even if they may subsequently include layouts!). Change the tick-box selection as required; this example is swapped from Layout to Model space. Regenerating the preview after making the change will update the image. 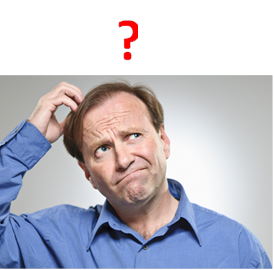 There are of course many other plot options available which may need `tweaking’ to get the desired results.